The VIA EPIA-M860 combines a 1.2GHz VIA Nano E-Series Processor with the VIA VX900H media system chipset creating a complete platform for demanding digital signage, media terminals, infotainment devices and online streaming video applications. Designed as a full-featured entry-level VIA VX900H board, the VIA EPIA-M860 is the first EPIA board which supports Windows Embedded POSReady 7, a flexible operating system designed to seamlessly connect Point of Service (POS) solutions with peripherals, servers, services and the cloud. The VIA EPIA-M860 also offers PCI, PCIe and Mini PCIe support, combined with mainstream DDR3 memory and both ATX and DC-in power support. The VIA VX900H media system processor provides DirectX 9.0 integrated graphics, crystal clear HD audio and Gigabit networking. 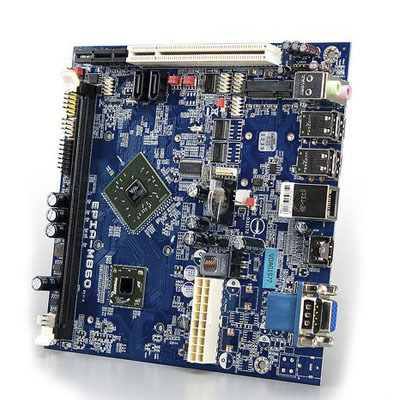 It supports up to 4GB of DDR3 1066MHz system memory and offers advanced video acceleration for MPEG-2, VC-1, H.264, WMV9 and Blu-Ray HD video formats.